T he current state of Laundromat oriented software is that it does not properly enable managers to exercise strong cash control. This is one of the key distinguishing features of LaundroMax, which has been specifically created to help managers maintain a firm control over cash inflows and outflows, inventory as well as attendance, all while gaining the oversight and accountability to understand discrepancies that may arise from daily operations. LaundroMax, an exclusive LaundroMat POS Software or Computer System and Solution, is an outstanding tool that can be used on its own or in combination with CleanMax and / or SyncMax depending on the specific demands of your business. 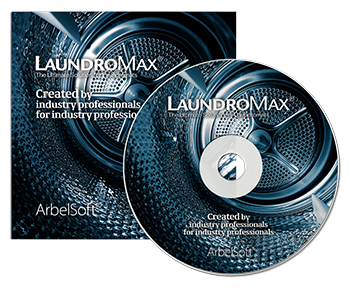 LaundroMax users can benefit from the highly efficient absent management and operations management tools, since the program offers the most expansive and versatile capabilities relative to any other dry cleaning interfaced software on the market. For example, we offer a pro-rated upcharge feature in addition to the traditional upcharge function such as a 5% additional charge for separation, bleach, or fabric softener, as well as the ability to upcharge by a dollar specific amount per designated weight. The	Mettler Toledo, A&D and CAS which are most common POS scales are interfaced with the LaundroMax and enters data concerning the customer drop-off laundry into the computer automatically upon which the machine's operation costs are calculated promptly. You can also enter drop off order data down to the decimal point to charge the customer accurately and calculate operational charges more precisely. The program has also been interfaced with Logic Controls, a customer pole display that shows the amount due, and an additional feature called "SoundMax," which greets customers with an announcement. Furthermore, LaundroMax has been synchronized with biometric recognition by a finger print reader for payroll and attendance control. Our employee time clock also allows 24 hour operations, which accepts shifts that cross over between days without requiring a check in and out at midnight. For enhanced security measures, LaundroMax also uses a dual or quadro cash drawer control technology that sets secure and specific access limits to cash drawers for each employee shift so that you can exercise accurate and strong cash control. The closing statement as well as the operation cost feature of the LaundroMax program allows for you as the manager to closely monitor cash inflows and outflows daily. On the job, there are unexpected events that could occur such as a coin jam in the machine, or a machine breakdown. Keeping these events in mind, we incorporated a "Refund," feature to the LaundroMax program, so that you can monitor the status of all machinery and account for discrepancies in cash outflows and credit usage for operating the machinery. Furthermore, in the case that such a cost is incurred, it will automatically become recorded as an expense listed under "Petty Cash," along with a reason for the expense. You can also view at a glance the status of all machinery to see which components are properly functioning. Any refunds issued due to malfunctioning equipment will filter through to the machinery status screen to keep you properly updated. LaundroMax has been interfaced with CCI Laundrycard, and ESD Cyberlaundry, which expenses the respective payment cards with a credit balance for operational costs necessary for processing customer drop off laundry orders. This can be done on behalf of the customer by a Laundromat employee when the customer pays the amount to the counter instead of via the X-Changer. You may also take advantage of the "Laundrycard" feature that can be used like a credit card or gift card for promotional purposes. For example, if the customer pays $20.00 in cash, you could issue an extra $5 credit. A unique feature of LaundroMax is that it enables for you to receive the customers drop off order while selling a variety of consumer goods such as Tide, Downy, Clorox, Cheer, Bounce, etc. In the case that a customer only wishes to buy some consumer goods, you can apply charges for those items by scanning the UPC or SKU code with an omni directional barcode scanner or simply by selecting the corresponding button for the item on the computer screen which holds enough space to store up to 312 different kinds of consumer goods on a single screen. However our program can accommodate an unlimited number of pages, allowing for you to support a vast variety of consumer goods and placing no restraints on your inventory capacity. You may also set sales item icons as being temporarily inactive instead of deleting them permanently in case you would like to reintroduce the product to your inventory in the future or supposing that you may have to accept returns on those items from past sales. In order to safely keep tabs on the status of your business and inventory, LaundroMax facilitates stock entry and reports with an immediate confirmation of your current inventory between all employee shifts so that you can keep track of sales, prevent potential losses or miscalculations, and minimize your business liabilities. LaundroMax offers the option for implementing various sales taxes, tax exemptions for certain items, and universal taxes and rates such as GST, PST, VAT, or even tax exemptions for certain states or countries in order for maximize the utility of our software for both foreign and US users. The print receipt feature can be controlled based on whether or not the customer desires a sales receipt, or you could create continuous serial receipt numbers for mandatory government taxation requirements for countries such as Greece or the Dominican Republic. To learn more about LaundroMax features, please look into the more detailed subject page links located on the left side of the page.